I have to say, I preferred this project back when I thought it was going to be a Walt Disney biopic. But no, it looks to be a narrative on the making of Mary Poppins....who wants that? I kid, I kid....(kinda). 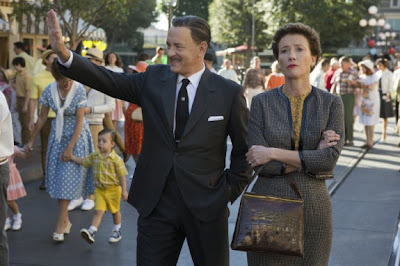 But since I was one of those kids who never really got around to watching the adored classic, the premise of SAVING MR. BANKS doesn't appeal to me as much as it might to others. Tom Hanks stars as the iconic Walt Disney who meets Mary Poppins author P.L. Travers (Emma Thompson) and is determined to turn to her popular children's story into a time-honored Hollywood movie (no matter how reluctant she is). Although the cast, which includes Colin Farrell (as Travers Goff), Paul Giamatti and Rachel Griffiths, is impressive, I can't say I'm all that jazzed to see the film. Perhaps it's the bitter memories of last year's film about the making of a film, Hitchcock? Let's hope SAVING MR. BANKS is better than that. Director John Lee Hancock, who helmed The Blind Side and The Alamo is behind the movie, which was penned by TV's "Terra Nova" creator, Kelly Marcel (who's also said to be writing the upcoming Fifty Shades of Grey movie). That's quite a pairing, eh? Check out the new trailer after the jump and feel free to share your comments. SAVING MR. BANKS opens in theaters December 13th. Well, since I liked "HITCHCOCK" and love "MARY POPPINS", I am looking forward to this film.